Last week’s other top-gaining mining stocks on the TSXV were Greenfields Petroleum, Aguia Resources, Solstice Gold and Sama Resources. The S&P/TSX Venture Composite Index (INDEXTSI:JX) closed Friday (April 5) at 629.82, up 3.63 points or 0.58 percent. US jobs data released that day shows that in March employment growth rebounded from a 17 month low the previous month, with non-farm payrolls increasing by 196,000. Meanwhile, February’s increase was revised up to 33,000 from 20,000. Here’s a look at what moved the share prices of these companies over the past week. Lithium-focused Desert Lion Energy is looking to build the first large scale lithium mine in Namibia. 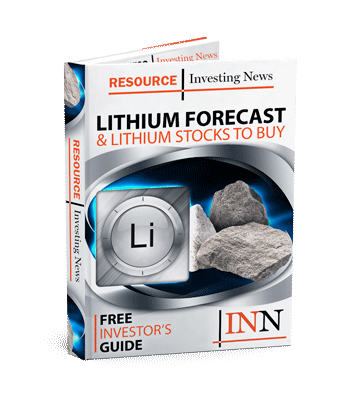 The company’s 80 percent owned land package in the country includes the historic Rubicon and Helikon lithium mines, and it is currently in Phase 1 of its production plan, which involves using stockpiled material to produce lithium concentrate. The company’s share price spiked 81.25 percent last week to hit C$0.15. During the period, it entered into a non-binding lithium hydroxide offtake agreement with BASF (OTCQX:BASFY). Greenfields Petroleum holds oil and gas properties in Azerbaijan. Its focus is on discovered but undeveloped areas and its main asset is an 80 percent stake in the Bahar Gum Deniz offshore block. The company experienced a share price increase of 50.52 percent last week, closing at C$0.73. Greenfields did not release any news during that time, with its last announcement being a mid-March update on its reserves. Aguia Resources operates in Brazil, where it holds three main properties: the Rio Grande phosphate deposits, the Lucena phosphate project and 52 tenements in the Rio Grande copper belt. Last week, Aguia’s share price jumped 50 percent to end at C$0.12, although it did not release any news. Its latest release came on March 31, when it closed a private placement for AU$874,708. Solstice Gold is focused on its Kahuna gold project, which covers 920 square kilometers in Nunavut. Solstice also owns secondary rights to an adjacent 805 square kilometers. The year has been quiet so far for the company; its only news came in mid-March, when it received all the permits needed to conduct exploration at Kahuna, including up to 20,000 meters of drilling across 75 to 100 holes, plus geophysics and rock and soil sampling. Last week, the company’s share price rose 44 percent to end the period at C$0.18. Sama Resources is developing the Samapleu nickel-copper-platinum-group-elements project in West Africa’s Ivory Coast. It is also working at the Yepleu prospect, located 18 kilometers from Samapleu. Last week, Sama announced drill results from Yepleu and reported that SRG Graphite (TSXV:SRG) has received an Environmental Conformity Certificate for its Lola graphite project in Guinea. Sama has a controlling interest in SRG. The company’s share price increased 40 percent last week to finish at C$0.35. Data for 5 Top Weekly TSXV Stocks articles is retrieved each Friday at 10:30 a.m. PST using TradingView’s Stock Screener. Only companies with a market capitalization greater than $10 million prior to the week’s gains are included. Companies within the basic materials and energy sectors are considered.